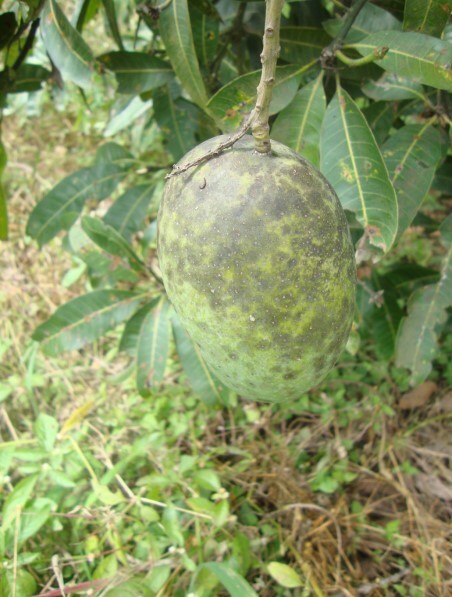 Smudgy fungal blemishes or surface blackening on late maturing mango varieties was recorded in Odisha as well as in various states during current mango season. Scientifically it is proved that this kind of blackening takes place in the absence of sap feeding insects and the pathogen responsible for this is different from sooty mould. This melanised fungal growth downgrades the fruits ‘eye appeal by spoiling green fresh look of mangoes and appears at the time of maturity after rains. An effort towards removing this melody was made at Central Horticultural Experiment Station, Bhubaneswar by dipping the fruits after harvesting in a mixture of chemicals. This dipping removes 90-95% smudgy blemishes from the fruit surface. In order to validate the process and result, it was successfully experimented at various places during the season. 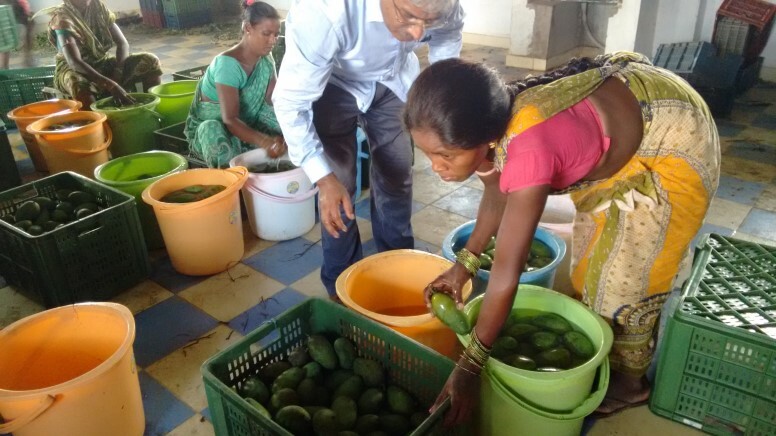 Apart from CHES, it was experimented successfully at DERAS farm of Directorate of Horticulture with 80 tonnes of mangoes coming from the TSP villages of Rayaghada district of Odisha. 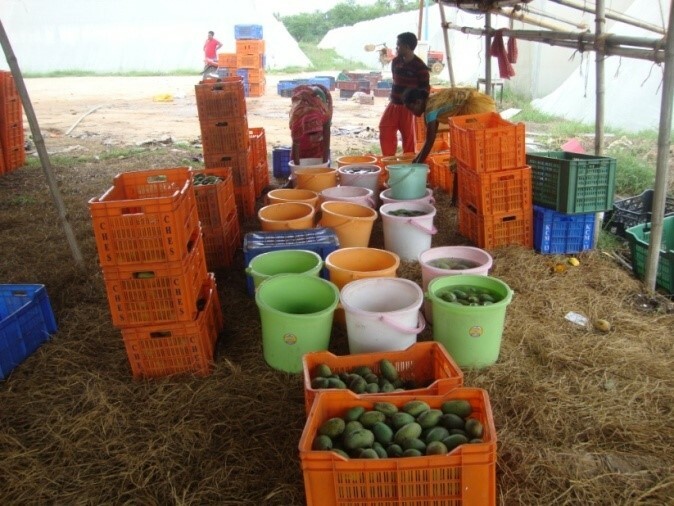 This work was coordinated by Mr. K.L.Mohapatra at Bhubaneswar one among the progressive mango farmers in Odisha. After removal of blemishes these mangoes were sold at good rate on par with unaffected good quality mangoes. 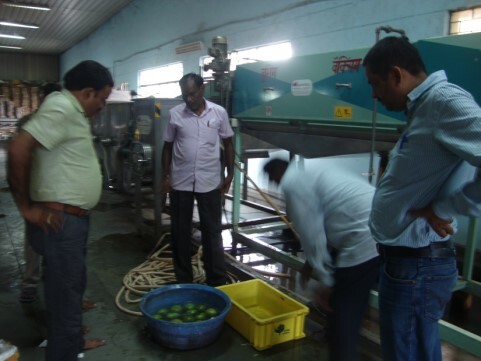 In south, the formula was evaluated at IIHR, Bangalore on five different varieties of mangoes viz., Alpnonso, Neelum, Amrapalli, Totapuri and Mayilampillai (root stcok) in presence of Dr. Krishna Reddy, Dr. A. Saxena, Dr.V.Ravindra, and G.C. Sathisa of IIHR. They expressed their satisfactory remarks over the performance of the treatment. 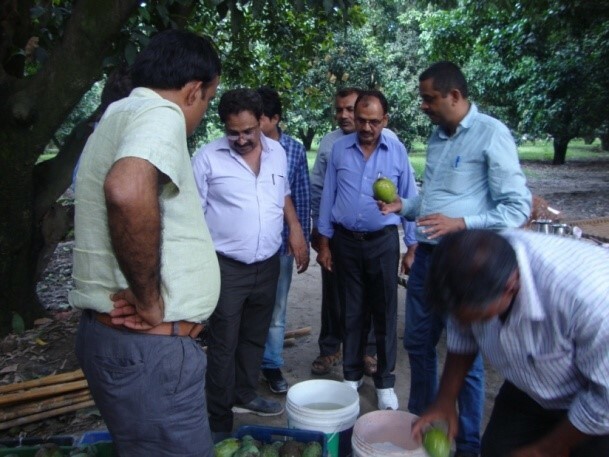 In order to see the impact of treatment in North India, the experiment was carried out in Saharanpur (Uttar Pradesh), one of the known mango belt of Northern India, where farmers are facing this problem especially in the late maturing varieties like Dasheri, Langra, Chausa and Fazali. Experimentation was carried in three places with due support from Horticulture SMD and approval of concerned authorities. The dip treatment was imposed in villages namely Gangoh and Marwa and at mango packing house in the presence of eminent farmers like Paramod kumar Goyal, Sethpal Singh, Rajpal Singh (Former RAC member- NRC Litchi), Mohd. Ajam Khan, Amir Khan, Kahara Afagan, Suhale Khan, Tarun Kumar ( Mango exporter) and many others. 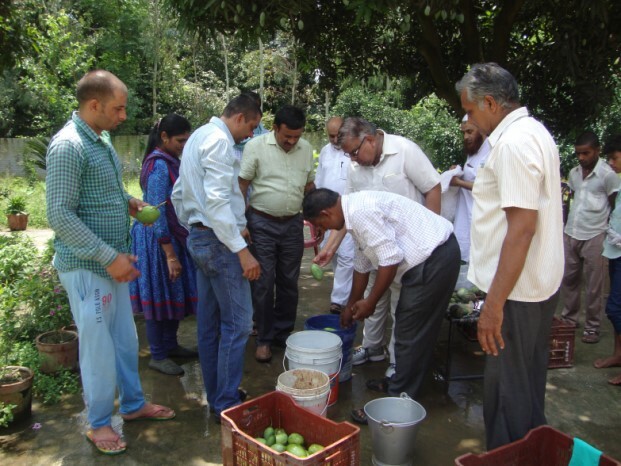 Dr. Binayak pratap Shahi SMS/ Asst .Prof (Horticulture), KVK, Shaharanpur organised the experiment logistics and local support in the process. Here again the experiment was successful and all present appreciated and demanded the product for further use. It is pertinent to point out that the material used in this experiment is permissible in organic farming. As such, in multi-locational experimentations, this post harvest dip treatment technology was found to be highly successful in removing the smudgy fungal blemishes as evident by various demonstrations. Further efforts are in pipeline to make this technology available soon to farmers of different regions.